Holi is not celebrated by Malayalis in Kerala. The few Holi celebrations that take place are mainly confined to cities and are confined mainly to youngsters. The traditional Kerala communities that play Holi include Gaud Saraswat Brahmins (GSB) and other Konkani communities. For them, Holi is known as Ukuli or Manjal Kuli. Holi celebrations in Kerala begin at the temples on the day of the holi full moon in early March. It is celebrated mainly by the Kudumbi community of nearly a million at 20 temples in the state over four days. Persecuted by the Portuguese in Goa, a section of the Kudumbi community fled Goa. Those who reached Kerala brought the festival of Holi with them and were welcomed by the ruler of Cochin. In some of the Kudumbi temples in Ernakulam, an arecanut tree is felled and carried to the shrine, symbolizing Durga’s victory over the demons. In some temples in Thrissur, a figure of a crocodile is modelled out of mud. According to belief, the goddess, in the form of a crocodile, helped the Kudumbis when they faced trouble while migrating to Kerala. On the second day of the celebrations, the Kudumbis get themselves sprayed with coloured water (containing turmeric) and dance to traditional Kerala percussion. The ceremony is called Manjakkuli equivalent to throwing of colour in the north. 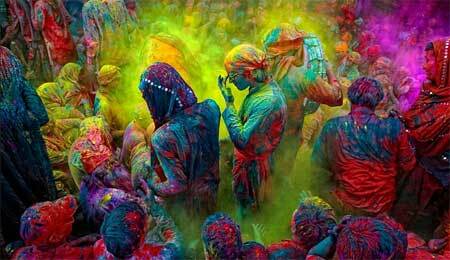 Holi is also observed by the North Indian and Gujarati communities settle in Kerala in India. But Holi is one celebration that is largely ignored in Kerala.